Mumbai: After giving back-to-back hits like Woofer, Vamos, Lado Rani and Nakhra Nawabi, Dr Zeus is back with his new fun song, Tha Tha with BeingU Music. 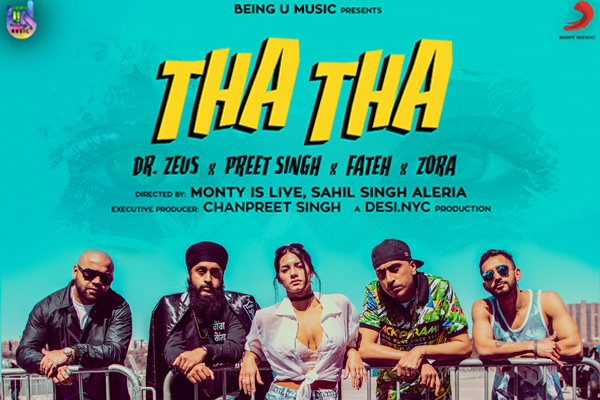 Featuring Dr. Zeus, Zora Randhawa, popular Canadian rapper Fateh Doe and Preet Singh, Tha Tha is a peppy Punjabi number that portrays a group of boys flirting with a beautiful woman as they try to woo her. The song is a perfect blend for a party number with Dr Zeus's composition, Fateh's rap skills, Zora's vocals and Preet's charm. Shot in New York, the music video gives the stylish city a desi makeover with Punjabi Mundas performing Bhangra on its streets. The song is an energetic and fun number, sure to be on every party playlist. The hit trio of Dr. Zeus, Fateh Doe and Zora are collaborating again with BeingU Music, after delivering massive hits like INCH and Nakhra Nawabi. After bringing together four artists from different walks of the world for their first ever chartbuster single Woofer, BeingU Music is surely bringing in cool new music. And with Tha Tha, the music company is heading towards its moto. BeingU Music Founder Akshit Kumar said, "It has been a successful quarter for us at BeingU and we see our vision of providing Indian musicians with a global platform moving ahead and with Sony Music helping us to enhance the scale of our music, we are excited for Tha Tha which is another great association with Dr. Zeus and Zora." Tha Tha is the next song from Dr Zeus’ album Global Injection. The fun number is sure to rule the charts and continue the successful chain of Dr. Zeus. MUMBAI: As the countdown begins; BigCityBeats World Club Dome 2019 - now in its seventh edition - will take place on 7 – 9 June 2019 in Frankfurt, Germany for its revolutionary “Space Edition”. MUMBAI: In the lead up to his anticipated new album Ride Waves , GRiZ shares final single, Find My Own way, a collaboration with 10-time GRAMMY-nominated rapper Wiz Khalifa. MUMBAI: This International Women’s day, Levi’s unveils the fifth season of the Levi’s #IShapeMyWorld campaign that celebrates the power of women, and their determination to inspire change. MUMBAI: Sony Music exclusive artist, Sukhe is all set to release his pop music video this month and it features none other than Krstal Dsouza – TV’s hottest actress. The song, I Need Ya, has a R&B vibe to it with a compelling rhythm that will get you to play it on repeat. MUMBAI: With the beats that are irresistible, a hook that sticks to you and Kamariya, a song that is number one this season, hits 100mn views in less than 40 days. Voiced by the talented Darshan Raval and composed by Lijo George and DJ Chetas, Kamariya is also a dance rage.